On the outskirts of the Aboriginal town of Pormpuraaw – beyond the scented frangipani trees, the rows of bungalows, and the lush tropical greenery – is a mountainous rubbish tip. Locals have their own name for it: Bunnings. As if browsing the Australian hardware store it’s named for, they pick through the tip for rubber, rope, bicycle rims. Detritus is then turned into art, woven with feathers and bones into the ocean sculptures that this remote Indigenous community has become famous for. “Bunnings” isn’t the only source of debris. 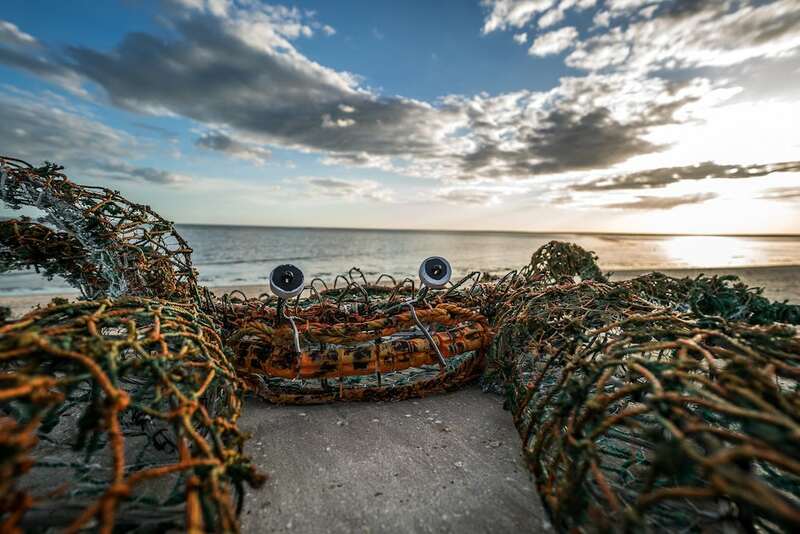 On Pormpuraaw beach, an idyllic stretch of sand flats and crushed shells located on the west coast of Cape York peninsula, plastic fishing nets wash up on shore – some kilometres long. Thrown overboard by fishers, they are known as “ghost nets”, eerie death traps that float through the currents, entrapping and killing marine life. The nets, once cleared away, form the frame of Pormpuraaw’s ghost net sculptures, a highlight of July’s Cairns Indigenous art fair. 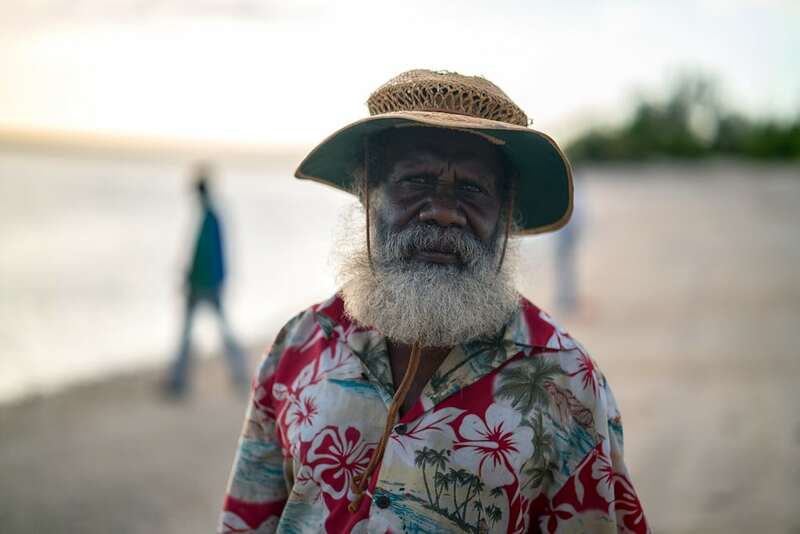 Sid Bruce Short Joe, a flamboyant artist who pairs his shaggy white beard with a red Hawaiian shirt, recalls a time growing up when sawfish, or “kapainyinh”, in his Kugu language, were plentiful. Now in his 50s, the first sawfish he has seen in years was in an aquarium in Europe, where Short Joe travelled to exhibit at the Oceanographic Museum of Monaco last year (he shared a private dinner with Prince Albert II). “When I see the sawfish I felt it in here,” says Short Joe, banging his heart. He is snacking on slices of cucumber in the art centre, where ghost net sculptures hang from the ceiling or sprawl, unfinished, across the floor. “It’s just like I was already connected to it again. Last month Short Joe also travelled to New York, to take part in the UN ocean conference. Shut off during the wet season, Pormpuraaw (meaning “entranceway to a house” in the Kuuk Thaayorre language) is only accessible from December to April via small aircraft. Situated some 650km by road from Cairns, it is home to both the saltwater Thaayorre and freshwater Wik people, and was established as an Anglican mission in 1939. Today the population numbers about 700. Facilities are scarce and opportunities scarcer: there is no high school, electricity is supplied via a diesel generator and (expensive) fresh vegetables are transported by plane. Like many remote Aboriginal communities, English is often a fourth or fifth language and unemployment is high, leading to alcohol and drug abuse, with grog tightly controlled. On hot, sticky evenings skinny mutts prowl the streets, howling into the still air. Short Joe, who speaks 10 languages and is a member of a Wik clan, remembers a time when his family hunted in the bush or fished in the seas for sustenance. With much of the population mired in poverty, art provides an income. The sculptures can sell for up to $15,000, with 65% going to the artist and 35% to the art centre. While they are not a traditional art form, weaving – particularly of dilly bags – is, and the ghost net sculptures are created in the shape of the artists’ totems, connecting the art to country. 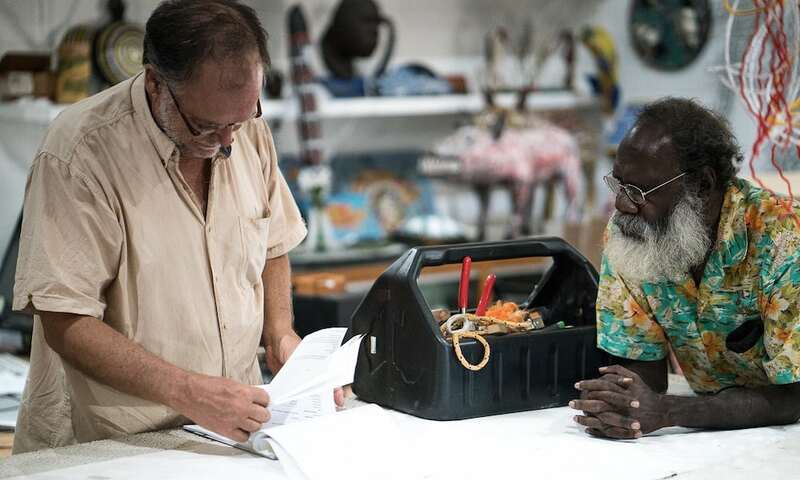 Totems are the artists’ “connection to past ancestors”, explains the art centre manager Jakubowski, an American who moved to Pormpuraaw eight years ago. “It is how they trace genealogy, it is how they claim land. But Keeper, like most of the sculptors, has a bigger concern: his sons and daughters, he fears, might not enjoy the ocean life he has grown up with or the fruits of fishing, which, when you dodge the lazy, fat crocodiles that line the muddy Munkan river, is how many a local wiles away an afternoon.